System auditing, CAD/BIM, budgeting/estimating and value engineering, design assist engineering, and project planning. Houle provides a full range of system auditing services for your facility. Our unbiased assessments can help you streamline your facility’s technological systems to match your business and operational needs. From providing you advice on how to optimize the technology in your facility to designing, implementing, and supporting the solution, our tailored services can help you address the changing needs of your company. To remain at the forefront of technology, Houle employs the latest computer-aided design (CAD) and building information modeling (BIM) programs for pre-construction coordination. With an in-house CAD/BIM department, design conflicts are resolved at the design stage. Through the utilization of BIM for clash detection, we can anticipate and manage potential problems before the start of construction, minimizing expensive delay and rework costs to the customer. Utilizing the latest automated estimating technology, Houle provides electrical, structured network cabling, security, low voltage systems, automated building controls, process controls, instrumentation and integration estimates to clients. As a multiple, integrated services provider, our various disciplinary estimators can collaboratively present you with a single estimate. The estimates can be based on customer provided drawings or from collaboration with the design team to review constructability with a focus on keeping costs down while still maintaining the design intent. Whether you receive a high-level estimate or a detailed and broken down estimate, our established internal review process ensures that the estimates you receive are thorough and accurate. Through value engineering, we will work with you to create customized solutions that match your budgetary constraints. We look for the best way to meet your facility’s requirements, finding an ideal blend of equipment and design that is cost-effective, while still delivering quality and performance. Our approach encompasses combining and modifying the overall system architecture in order to bring you value. Where required, we can pre-plan architecture or propose financing options to enable late stage implementation of systems or solutions. Houle takes a concept-to-completion approach with the design process. With extensive design skills across multiple disciplines, our team of in-house engineers, technologists, lighting specialists, and project managers will work closely with the entire project team to develop concepts, drawings, specifications, operational documents, and training aids required to construct and operate the facility. When utilizing Houle for your design-build projects, you can expect faster delivery and shorter construction turnaround time as duplicate communication between design and construction is virtually eliminated. Additionally, construction lead-time is reduced because Houle can identify long lead-time items early in the process: procuring these items prior to the start of construction. With Houle fully involved in developing design concepts and documentation, subsequent change orders are significantly reduced in frequency and scope. Houle’s comprehensive approach to project planning results in the successful delivery of projects on-time and on-budget. Utilizing practices to minimize waste, a roadmap is developed that provides direction and accountability for the project team. 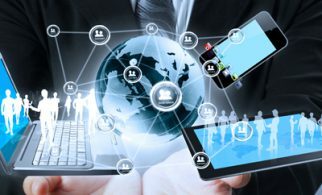 The plan includes a list of key materials for the project and timelines for procurement, a sequence of construction work so the right people are scheduled at the right time, and a project schedule that is synchronized with the other trades. Workforce mobilization, deployment & installation, project management, commissioning, and prefabrication. 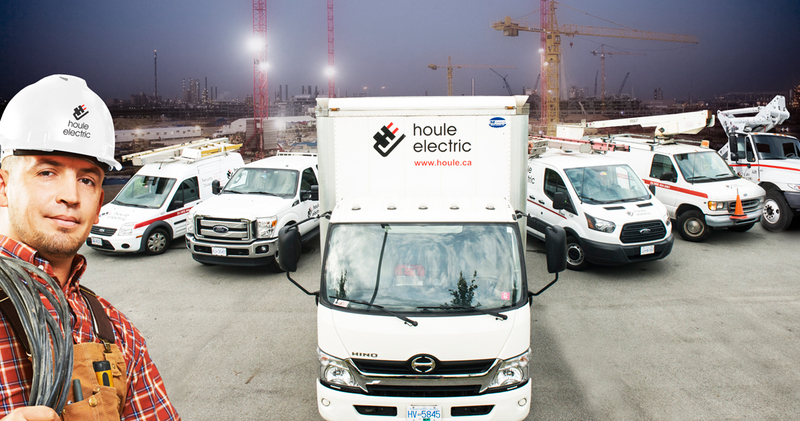 Due to our large workforce and our access to a highly skilled team of unionized electricians, Houle has an outstanding record for consistently being able to get the project completed on time. Our team includes, but is not limited to, highly experienced electricians, technicians, project managers, estimators, superintendents, and foremen. As a result of our geographical presence in British Columbia, we can shift resources, (especially key supervisory roles), throughout the province to areas of demand. Historically at peak demand, we have been able to mobilize a workforce of up to 1,400 employees. With over 7 decades of experience in the construction industry, we have learned that proper planning and communication are critical to a project’s success. Prior to mobilization on-site, Houle conducts kick-off meetings, internally with the project team and externally with the client, trades, subtrades, and suppliers, to establish a common understanding of the project. Meetings with these teams extend throughout the project, with regular coordination meetings to facilitate communication. Similarly, installation planning continues throughout the project, with various planning sessions held to ensure that critical components of the project are properly managed. Because we are equipped to manage any project as either a Prime Contractor or Subcontractor, clients look to Houle to deliver complex and sometimes challenging projects. Our team of highly qualified project managers are recognized for our ability to deliver projects safely, on time, and within budget. Our project managers’ expertise in both the field and the office is enhanced by on-site project experience. We take the time to understand our client’s overall goals, the scope of work details, and the cost implications of every scope item. From project initiation to project close, Houle has the experience to safely, efficiently, and effectively manage any size of project in any location, with resourcefulness and professionalism. While many may think that commissioning is a process that occurs at the end of a project, at Houle, commissioning happens through the duration of the job. Throughout the project, quality assurance / quality control measures are performed to ensure that all installed systems have achieved optimal results for our clients and that everything complies with the original design specification. With our in-house commissioning capability, we perform thorough checks and balances to ensure that once we have left the job site, the systems operate as intended and that operators are well-equipped to operate the facilities themselves. Inspection and verification reports are created and submitted through the construction and design chain to the client. Relevant and user-friendly Operations and Maintenance (O&M) Manuals are provided so that you can effectively and efficiently support the lifecycle of your facility. The as-built drawings we provide accurately reflect the changes made in the field and are valuable tools for O&M staff and for future system changes and/or additions. Houle can also offer radio frequency identification (RFID) tags that can help you track, monitor, and maintain any tagged asset. As a more durable and longer lasting alternative to the conventional barcode stick, you can easily scan the tags using a standard smartphone to extract important data including service history, password, and programming information. If there is a service failure with the tagged asset, using this technology Houle can access the information on the asset even before going to site. Houle is pushing the envelope developing new prefabrication ideas and refining our methods to provide greater value for our customers. By pre-assembling components off-site and delivering them to the construction site just-in-time, Houle can help to reduce overall schedules and risk associated with on-site work. Our Panel Shop, which is CSA C22.2 No. 14 and UL508A approved under Intertek, builds certified control panels. This recognition provides a known quality of products used and a documented mythology of assembly. Following project completion, Houle is committed to maintaining the same high levels of service and attention that you received during the project. 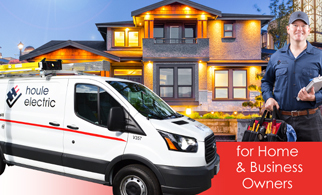 Our dedicated Service Team is available for any of your post-project inquiries and maintenance support. All installation work is warrantied by Houle 12-months after installation. Clients can enroll in an optional Service Maintenance Agreement that can incorporate numerous services to keep your facility fully functioning. Available services include regular thermographic screening, DDC Control audits, and Security audits. All these services are supported internally by our Houle Operations Centre, a call centre that provides after-hours call answering and 24 hour service dispatching. Though Houle has the ability to self-perform a majority of our work, we have established a network of qualified subcontractors to perform specialized activities such as civil work, scaffolding, trenching, coring, concrete, and line work. To serve our client’s needs, subcontractors are selected based on their cost, capability, experience, location, and safety. All subcontractors go through a pre-qualification process that involves a Subcontractor application, Workers’ Compensation clearance letter, and Occupational Health and Safety Program submission. Prior to completion of work on-site, subcontractors’ performances are evaluated and tracked for future reference. 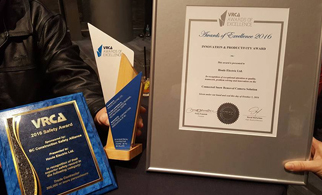 Houle has a history of successfully delivering General Contracting projects, including those for port authorities, health authorities, provincial and federal government, universities, mines, as well as energy and utilities companies. When acting as a General Contractor, Houle self performs electrical, structured network cabling, security, low voltage systems, building controls and automation, process controls and instrumentation, and integration. Our single-source capabilities streamline the entire process for clients, reducing costs and risks, and shortening project schedules.